Cartier eyewear is precious jewelry for your eyes. Founded in 1847, Cartier is known as "the jeweler of kings, and the king of jewelers" by King Edward VII. Today, Cartier is one of the world's best-known luxury brands. Worn by stars to professionals, Cartier eyewear and Cartier sunglasses are highly prized for their unique style and quality handcraftsmanship. 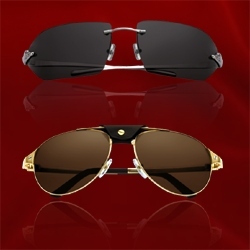 Cartier sunglasses provide the perfect combination of protection (from UVA and UVB rays), safety and fashion. Even on the sunniest days, Cartier sunglasses can offer enough protection by providing both polarized and Rx adaptable lenses.